It's unfortunate that the current debate seems to be simply about the retirement age, rather than a broader discussion also encompassing the Cullen Fund, Kiwisaver and how we as a country look after the low waged and/or non-home owning citizens. Why does the media report 'over production in Europe' when talking about the global milk market? Meanwhile, the government continues to put money into irrigation schemes. 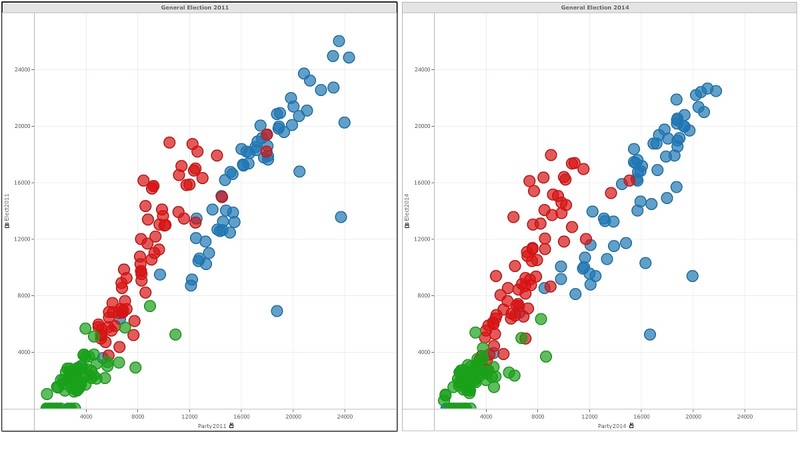 Electorate v Party vote scatter plot – in many respects the pattern hasn’t changed much from the previous election. A bit small to read - the Y axis is the Electorate vote, X axis the Party vote. The plot on the right is 2014, the left is 2011 and I think you can work out the colours. 2. Dirty Politics - a left wing conspiracy theory. Both sides do it. 3. Kim Dotcom - he's trying to buy his way into politics so he can stay in the country. 4. GCSB - look at what has just happened in Australia. I don't mind being spied on if it means we don't have beheadings in the street. The bullsh*t from the Herald continues... A piece about Judith Collins this morning completely overlooks that fact that her majority was significantly reduced compared to 2011 (or have I done my maths wrong). "As many of you know, I act for Nicky Hager. I vetted his book, Dirty Politics, and the three before that..."